FullStory helps you build incredible online experiences by capturing every click, swipe, and scroll, then replaying sessions with pixel-perfect clarity.? A very interesting performance case study on Treebo, India’s top rated budget hotel chain. By Addy Osmani and Lakshya Ranganath. An in-depth look into the thought process and code for building a grid layout with graceful fallbacks powered by feature queries. By Chen Hui Jing. React PowerPlug creates a state and passes down the logic to its children giving life to dumb components. By Renato Ribeiro. A great place to find upcoming conferences. A curated collection of newsletters and roundups for designers. A great demo by Mariusz Dabrowski with a detailed explanation of how it was done in this article. An interesting read on the CSS in JS problematic by Kevin Ball. Some beautifully flapping butterflies by Yoichi Kobayashi. Internal CSS Style Sheet Generator for the above the fold content. A spacing tool for design systems made by Hayk An. A lovely, handwritten brush font made by Ieva and Krisjanis Mezulis. Priyanka Godbole wrote this excellent article about a great framework concept a while back. Need some high-quality, super geeky Halloween vectors? Creative Veila has got you covered. A great guide on how to build or improve a search experience. By Max Grigorev. A free typeface designed by Simon Dunford. Create a promise that reports progress to the user, useful during long-running async operations. Learn the most important concepts of Ruby from scratch in this tutorial by Leandro T.k. Turn your source code into beautiful syntax-highlighted images. Great for presentations. The library of practice briefs and helpful resources for designers just got a major rehaul. Read more about the new version in this article. Collective #348 was written by Pedro Botelho and published on Codrops. SaaS Customer On-boarding is the process that users have to experience while initiating their journey as a customer on a company’s software application. Customer on-boarding initiates from the experience that employees previously had to undergo while joining a firm. The on-boarding process sets the tone for a good user experience. Long story short, special emphasis should be given to make the on-boarding process as flawless as possible. All the aspects of the process play an equally important part in forming a desirable reputation of the brand in the eyes of the customers during the on-boarding process. I will be discussing the first step to the on-boarding process, the sign up forms, in detail today. Sign up forms are the first point of contact between an application and a customer, which is why I will be discussing them before the rest. By providing tips which can improve the experience at the customer’s end, I will be providing start ups with 6 useful techniques to make the process smooth and convenient. If you ask the customers to fill a large amount of fields on the sign up form, there is bound to be some discontent at their end. You have to limit the questions you ask, to increase the rate of conversion from the sign up form to the other parts of the process. By decreasing the amount of questions you initially ask, you can ensure a higher conversion rate. Having understood the importance of keeping the questions limited, it is imperative that you know which questions to cut out and which you should include. Anything that can directly initiate your relationship with the customer should be asked. An email address is good enough for a subscription, so it should be your priority. Shopify’s sign up page is an example of keeping it precise and to-the-point. One noticeable thing about the current generation is their infatuation towards joining the bandwagon and keeping up with the fads. So, if you are able to put up interesting figures regarding the people who have signed up on your website with success, you can be guaranteed of a positive response from the customer. Salesforce is an excellent example of a company that does this. 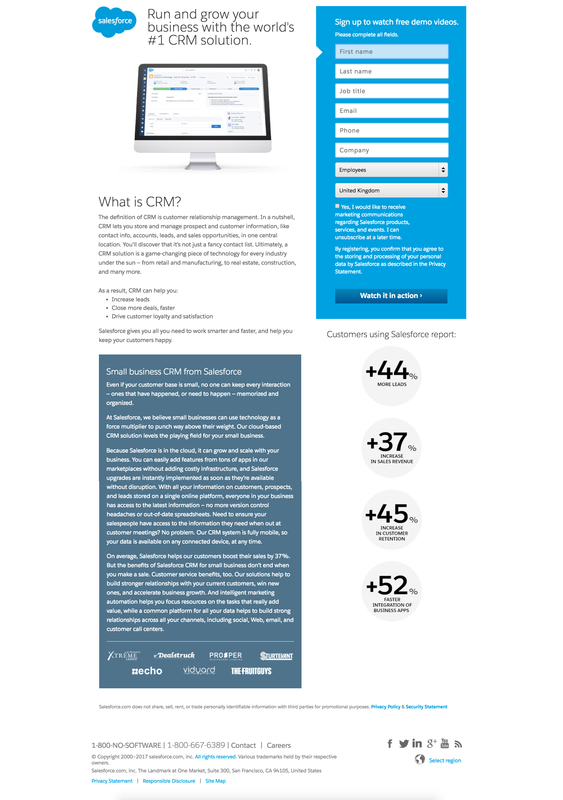 Right below the signup form, a customer can find the benefits that customers of Salesforce have received. 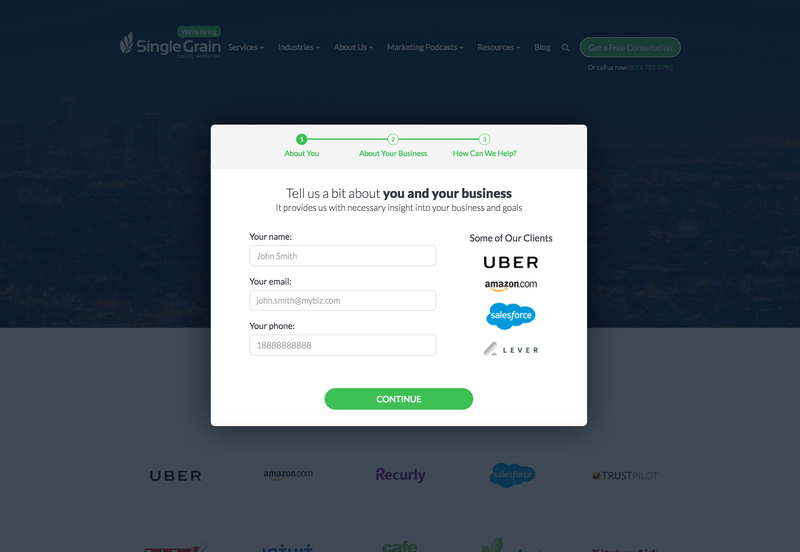 SingleGrain decided to create their social proof by displaying on the sign-up page logos of their clients. 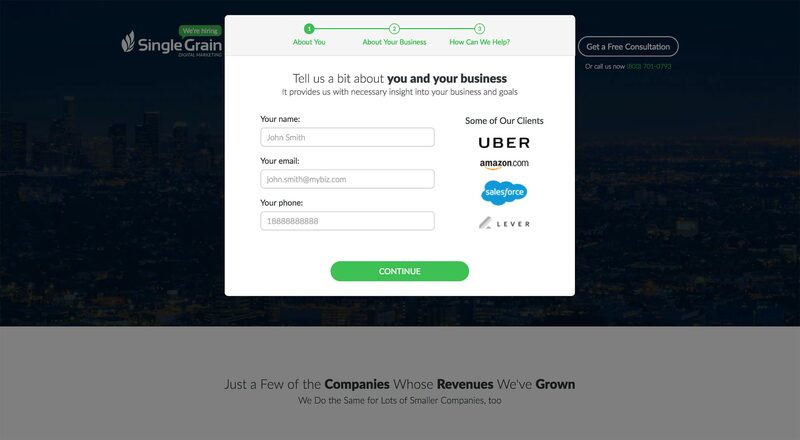 If you are able to sell the sign up to the customer, you have aced the first step of the SaaS customer on-boarding process. You need them to sign up on your website, and the customers need something for doing that. To be fair, the customers want as much as they can get, for giving as little information as they can. This is where a conundrum arises. The confusion can be solved by creating a deal for the customer. Get the customer to perceive they’re benefiting from the deal. This can be done by offering the customer something in return, something which motivates the customer to move into the sign-up process. The value proposition should be clearly visible for the customer to comprehend. 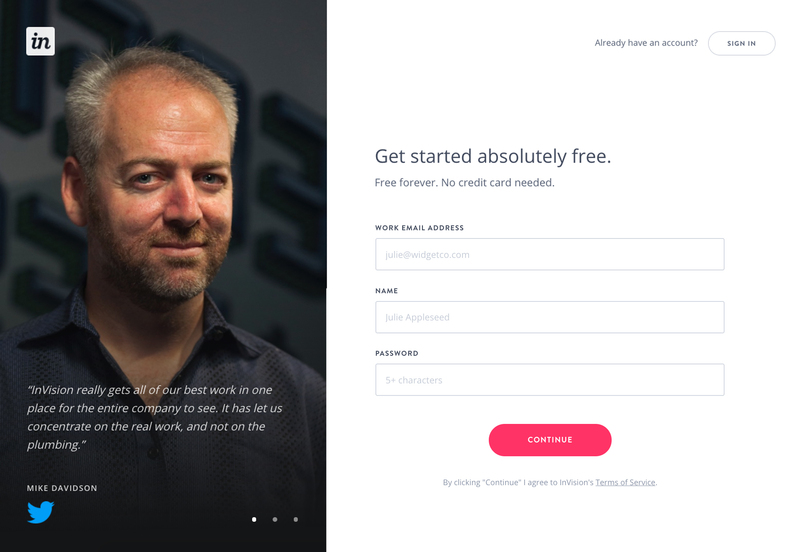 Many SaaS companies like Convertize.io come up with a brilliant motivation argument—the free trial period that often motivates individuals to sign up. 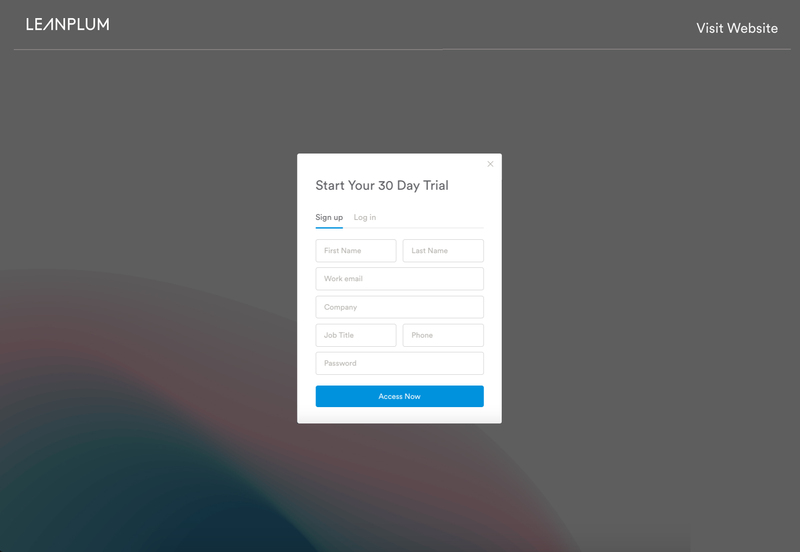 Convertize gives your 14-days trial as an opportunity to test their product. The offer you make to the customers plays the role of the main attraction and serves as bait. If the offer is viable and good enough for the customers, it will help in attracting them to the brand. If it is not, then customers won’t be attracted to your brand. Thus, the offer you make to the customers is your lead magnet or core attraction. All other details just complement the lead magnet into initiating the perfect deal with you. 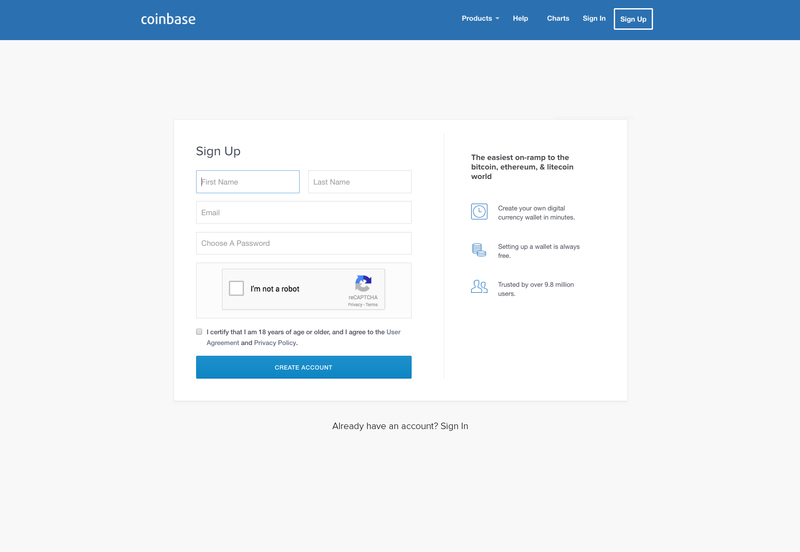 Coinbase’s signup form is an excellent example. The design is simple and user friendly without compromising on looking sleek and elegant. Let customers know what’s going to happen next. Don’t leave them quizzical as suspense is not the feeling you want to create here. Make the customer trust you from the word go, by letting them know what they’re signing up for. If consumers have to submit the form feeling uncertain about what is going to happen next, there is bound to be friction. The best way to go about this is to have your submit button say something other than just ‘submit’. You can write whatever is going to happen next on the button. This way there will be less uncertainty and the users will be more in control. Leanplum’s signup page is a good example of this, with the promise of instant access after signup. 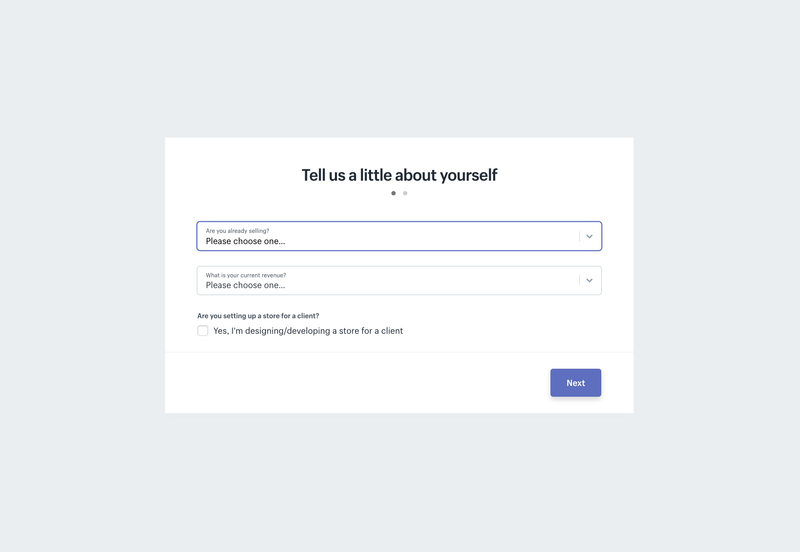 Giving users the option to sign up using social media accounts can drastically speed up the process for the user and increase the probability of conversion. Common social media sign-in options include Facebook, Twitter, Google Plus. Clicking on a social media button for access looks far more appealing to the user, as compared to filling in a number of information fields. There are a number of advantages and disadvantages of using social media signups. No need to worry about an additional password. People with an active online presence are usually members of a lot of websites. Remembering an additional password can be worrisome and can deter a user enough to not sign up for your website. A social media sign-in option eliminates this deterrent. Market Research. A social account sign-in can grant you a wealth of information about your user, ranging from personal preferences to birthday, where they live, their friends etc. This can allow you to better assess your target market. Engaged Users. According to online research, users that log in to other websites via Social media accounts stay longer. This research was conducted by Facebook. Users can Like / Share and since their friends are right there, this can increase the market reach for your website. Anxiety from too many options. If you offer multiple social media sign-in options your user could become flustered and then decide to “come back to it later”. Would it affect your brand? Giving a social media sign-in option is creating the presence of another brand alongside your own. Will the option really result in a greater conversion rate? Also, if a user’s social media account is hacked, their account on your website may suffer too. Relying on a third party. If a social media server crashes, it could restrict your user’s access to his/her account with you. You would need a backup for that eventuality. Accessibility. Some workplaces have blocked social media websites. Therefore, if your users log in through social media, they would not be able to. Privacy. Some users are extremely privacy conscious and would rather create an account with you rather than use their social media. We’ve talked about how it’s important to have a signup page that is concise and enticing by way of its content and design. However, the signup page is part of something called the “sign-up flow”. The signup flow refers to the steps in the process that the user has to take to go from signing up to using the product / service. We encounter another term in this regard, which is “friction”. 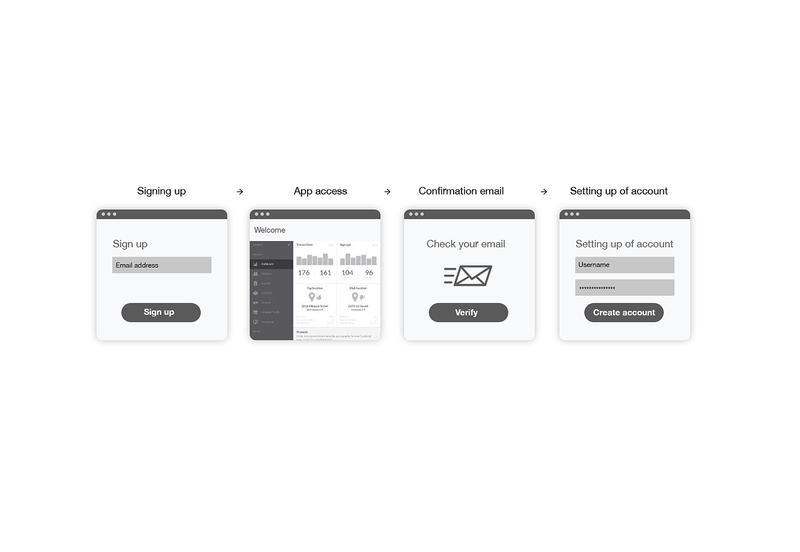 Simply put, friction represents the amount of effort that the user has to invest in completing the signup process. 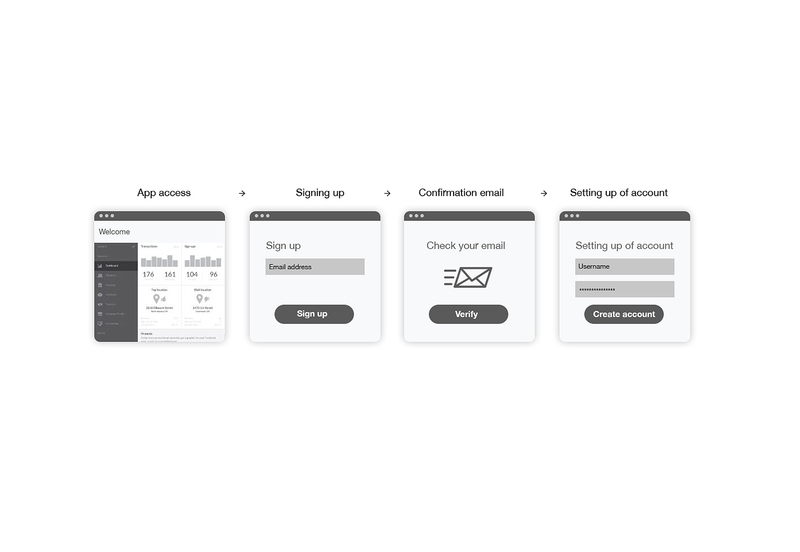 Let’s talk a little bit about friction and then we’ll go on to discuss common signup flows that companies use. Information Cost. Total number of fields to be filled in by the user. Steps to Completion. The number of steps / pages the user has to pass through to get to access the application. Effort investment. Number of decisions that the user has to make and extra activities to be completed. Signup flows can be designed in innumerable ways. The flow is dependent on the product, the target market and many other variables. However there are three broad based signup flows that we’ve observed, and usually other signup flows are more or less derivative of these. This is the most commonly used sign up flow that companies use. Users are familiar with this process and consequently don’t have to think much about it. However there are a lot of steps that the user needs to take before getting to the app. Being able to instantly access the app after signup is the reason why a lot of friction is eliminated in this approach. However this way you could get a lot of users who just want to try the app out, without any intention of completing the signup process. 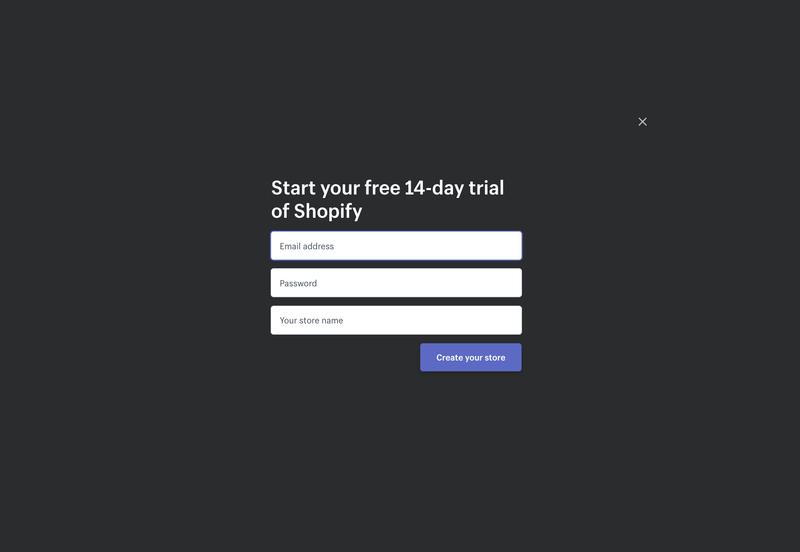 A signup flow that goes one step further than the second approach, this is absolutely frictionless. p class=”p2″>Sign-up forms don’t come across as the most exciting items to design on a website. In fact, most companies neglect the importance of sign-up forms by implementing below par designs. You can either inculcate a striking palette, a witty heading or an aesthetic design. But whatever you do, make sure that your first impression weaves its magic over the customers. Keeping in mind the importance of the sign up page in setting the right impression, there should be no errors whatsoever. 5,000+ Pixel-Perfect Icons from Icon54 – only $24! The B&O Play app implements a series of satisfying transitional effects upon interaction with scrolling, color choice, and selection. When you pick the right platform, creating isn’t a struggle! Change the way you make websites forever. Vitaly Friedman continues an excellent series on UI patterns and dives into feature comparison tables. Charlie Deets explores skeuomorphic and spatial menu systems, highlighting advantages and disadvantages. A great read by David Gilbertson on making an informed decision when it comes to using web fonts. A skinny all-caps font designed by Missy Meyer. Learn how building a flexible, collaborative, and scalable typography guide helps designers and engineers collaborate better. A Mac app that lets you prototype WebVR interactively without prior coding knowledge. Read about how Christina Wodtke teaches Interaction Design in this interesting article. Learn how to improve accessibility for people with visual impairments. By Christopher Ratcliff. A PHP snippet bot that generates code examples for quick copy/pasting. A Sketch app plugin that distributes shapes evenly between multiple objects in Sketch. Learn how to teach a computer to master a simple video game using the q-learning reinforcement learning algorithm. A new site with free photos, vectors, icons, fonts and videos for personal and commercial use. A great line icon set designed by Agente Studio. In this article by Ire Aderinokun you’ll learn how to use pa11y, a set of free and open source tools that aims to make designing and developing accessibility easier. An ultra small CSS in JS library by Masaaki Morishita. Victor Tramontin designed this creative display font. Collective #341 was written by Pedro Botelho and published on Codrops.